The global marine seismic equipment and acquisition market has so far been an extremely consolidated one, with respect to its competitive landscape. According to Transparency Market Research in its recent publication, nearly 90% of the market was taken up by the top six players in it. SeaBird Exploration PLC, Fugro N.V., Polarcus DMCC, TGS, PGS, and CGG have consistently been the leaders of the global marine seismic equipment and acquisition market for the recent past. The competition within the global marine seismic equipment and acquisition market is expected to rise further between the handful of players leading it, primarily due to a declining rate of demand for the equipment by the primary end user of the market: the oil and gas industry. The leading entities in the global marine seismic equipment and acquisition market are known to hold wide multi-client marine seismic databases. According to TMR, on the basis of technology, the global marine seismic equipment and acquisition market is expected to expand at a CAGR of 5.3% within a forecast period from 2015 to 2024. By the end of 2016, this market was calculated to have reached US$3.73 bn, and is expected to reach US$5.66 bn by the end of 2024. On the basis of equipment, this market is expanding at a CAGR of 4.5% for the same forecast period. It was calculated at US$359.8 mn at the end of 2016 and is likely to reach US$533.9 mn by the end of 2024. 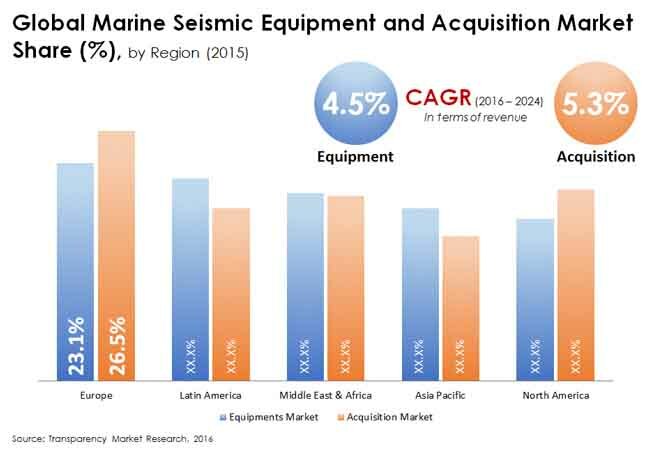 Europe led the global marine seismic equipment and acquisition market in 2016 with a calculated value of US$987.1 mn in technologies and US$86.4 mn in equipment. The bulk of this high demand volume and value generated has been attributed to the region’s growing demand and production rates for conventional oil. Analysts expect Europe to remain the leading region in the global marine seismic equipment and acquisition market till 2024 for the same reasons. “North America is another region expected to continue showing a high demand for global marine seismic equipment over the coming years. It is currently in the second position as far as demand volume is concerned. The end users of conventional oil are increasing in this region, especially from mining and construction, fuelling the demand for better exploration and extraction methods. However, emerging economies are expected to be the lands of opportunities for the players in the global marine seismic equipment and acquisition market. This is true especially for Latin America and the MEA regions. Both regions already hold strong oil and gas industries that are showing optimistic signs of further progress,” states a TMR analyst. Based on technologies, the global marine seismic equipment and acquisition market can be segmented into 2D, 3D, and 4D surveys, along with bottom nodes. Of these, 3D survey equipment are finding a greater number of takers than the others, thanks to their ease of use, relatively lower costs than 4D survey equipment, and better development streaks. Over the foreseeable future, 4D survey equipment could witness greater demand due to expected key developments. The global marine seismic equipment and acquisition market is, however, facing the inevitable problem of a decrease in the overall reduction in new survey contracts over the coming years. End users are finding it harder and harder to cover the costs of running and maintaining survey equipment through sales and operation profits. “Future prospects for the global marine seismic equipment and acquisition market may lie in the field of operations that depend on the conventional oil and gas industries. Their diversification can be key to the procurement of new contracts in the market. These end users include mining, constriction, and mineral extraction, along with similar profiles in subsea fields,” adds the analyst.